This image matches the android image used on the Ippo Q8H v2, which has a different case design. Like all things A23, this hardware is not supported. It is however a prime target for development. For more information, check the Allwinner A23 SoC page. Gently push the back cover outwards from the screen with your plastic tool. You should soon feel the clips pop. When closing back up, replace the connector side first. Verify the information below according to our UART howto. There are 2 pads right next to the SoC. The one closest to the SoC is RX/TX, the other is RX/TX. 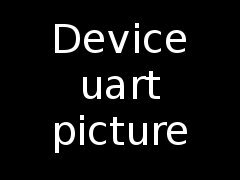 Attach some wires according to our UART howto. This hardware is sold under many guises. If it is claimed to be an A13 tablet but with a 4.2.2 android, then chances are that it is an A23 one instead. This page was last modified on 27 May 2016, at 10:14. This page has been accessed 11,831 times.